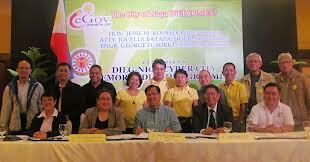 The Province of Compostela Valley and Municipality of Mina, Iloilo topped this year’s eGOV Awards or the Awards for Excellence in ICT for Good Governance for Local Government Units organized by the National ICT Confederation of the Philippines (NICP), in partnership with the Department of the Interior and Local Government (DILG). Announcement and awarding of winners were held last October 24 in Legazpi City, during the closing ceremonies of the 7th National ICT Summit of NICP hosted by the Legazpi ICT Council and Albay ICT Association led by its president, Rosemarie Quinto-Rey. Now on its fourth year, the eGOV Awards is an annual search for the best practices in local government units in utilizing information and communications technology (ICT) to effectively and efficiently deliver its public services directly to its constituents and to its business stakeholders. NICP Trustee and chair of the 2015 eGOV Awards Jocelle Batapa-Sigue said the awards aim improve local government units across the country by harnessing the potentials of ICT towards raising the bar in delivering public service. By drawing attention to the best practices in integrating ICT capabilities and solutions, the different sectors of society, and local government units are enabled in their roles as catalysts of change. The Municipality of Mina, Province of Iloilo garnered first place in the G2B category with its Municipal Agriculture Information System (MAIS). It is a dynamic software and an information system that provides a mass storage of agricultural data that serves as a decision-making tool with an up-to-date inventory of all agricultural commodities of farm production and provides easy access to farmers on a commodity’s supply and production situation real time, designed to facilitate linkages from its place of origin (farm) to market local and global. The Province of Compostela Valley topped the G2C category with its Decision Support System (DSS) for Provincial Voluntary Blood Services Program, which clients include the provincial blood coordinator, municipal blood coordinators, blood donors, blood customers and potential blood donors and helps blood coordinators monitor program implementation by way of generating blood status reports such as donation statistics, list of deferred donors and list of donors due for donation. DSS supports collection of safe blood by processing donor donation records and identifying corresponding donor donation status and provides facility for potential and existing donors to check donation eligibility and to view blood collecting drive schedules in their localities. Second place in G2B is Tagum City with its Business Permit and Licensing System designed to link various LGU offices involved in tax assessment and collection, which shortened and expedited the process of securing business permits in the city. Placing second in G2C is Bogo City, Province of Cebu with PROJECT CHARLIE (Communication Hub Accessible in Region and LGUs for Information and Emergencies), and a voice-based system that harnesses voice technologies, combining IVR (Interactive Voice Response) Technology, Voice over Internet Protocol (VOIP) Technology, Text-To-Speech (TTS) Technology and Wireless Technology to help establish a single point contact for all Government Services. PROJECT CHARLIE is essentially a phone-based support or Information Board for LGU which answers routine inquiries and allows a citizen to get as much information from LGU by simply making a call to the LGU’s phone support number anywhere, anytime 24/7. Third place in G2B is the Muntinlupa Online Real Property Tax System (MORPS), a web service created by the city government of Muntinlupa, built for the purpose of creating another payment system that is convenient and accessible, using computer or mobile devices at home or anywhere and allows and allows users to view their bills, manage their accounts and choose their mode of payment. Third Place in G2C is San Fernando, La Union’s Barangay Information System (BIS), a collaboration project between the city government and the 59 barangays which is an in-house developed web-based application that provides simple and easy to use scheme in the administration and management of small-sized data in the barangay level that is translated into the city level demographics. The system was designed to capture substantial data at the grassroots level that are critical in the formulation and implementation of the development plans for both the barangays and the city. Tying in the third spot for G2C with San Fernando is the Municipality of Mlang, Cotabato’s 3 e’s community based ICT program, an integrated ICT enabled services which address education, employment, and entrepreneurship and livelihood utilizing values education as the central component of the program. The program is holistic approach towards community development by combining technology with the right values to create a sustainable and lasting impact to its intended beneficiaries such as out-of-school-youth, college drop-outs, persons with disabilities, senior citizens, indigenous people, unemployed or job seekers, informal sector, children affected by mad made calamities, solo parents, child laborers, grassroots women, farmers and others. The eGOV projects of the LGUs are adjudged based on four criteria, namely, innovative management, or the degree to which the entry explored, applied and managed the elements and “outside-the-box” strategies that brought about the success of the entry; impact or the major results, their effects and benefits to the recipients of the service (public, employees, or business); or relevance or how the entry relates to the overall objectives of the LGU and to the category to which it is nominated; and replication potential or the model qualities of the practice with the possibility and applicability of replicating it in other localities. The objectives of the annual eGOV Awards are to encourage the effective and efficient utilization of information and communications technology (ICT) in the delivery of services and in the performance of duties and responsibilities by local government units (LGU’s), to commend, collate and document best practices of LGU’s in integrating ICT in their processes to serve as example and benchmarks to other LGU’s, to improve the business ecosystem of the LGUs and motivate the private and business sector to actively participate and/or invest in the growth of the LGU’s, and to promote transparency and accountability in local governance, Batapa-Sigue said. Batapa-Sigue also said that for 2016, there will be an additional category which is G2P/P2G or the use of e-payments or electronic or online modes of payments for transactions between persons and government, such as taxes, salaries and benefits.